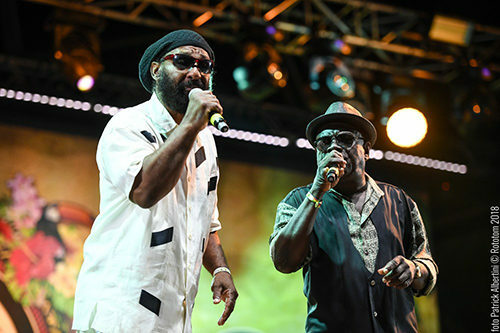 A comprehensive set by Jamaican singer Tarrus Riley was among the highlights of a memorable conclusion to this year’s Rototom Sunsplash Main Stage activity. He and his BLAKSOIL band, directed by saxophonist Dean Fraser made a non-stop, carefully rehearsed show look easy during the 25th festival’s historic final night. Tarrus was carrying a tradition of Rasta reggae music handed down by the likes of legendary harmony group the Mighty Diamonds. Sadly, one of the trio, Bunny could not make the journey to Spain, but the stern Judge and the sweet melodies of lead singer Tabby Shaw took everyone on a vintage voyage along memory lane. Songs like Right Time, I Need A Roof and Pass The Kutchie were rendered to an adoring public by the very capable Redemption band. The Main Stage then fast-forwarded from the 1970s to modern Jamaican dancehall. 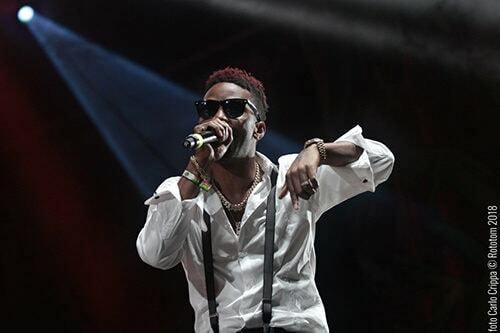 Gritty voiced deejay Konshens raised the tempo and worked up a sweat. 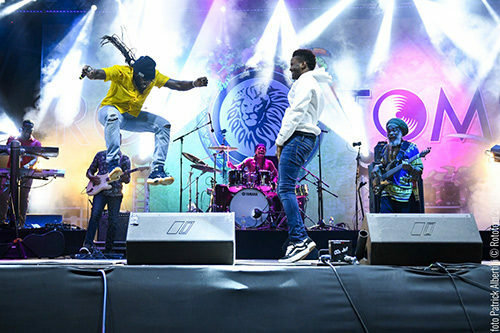 Following a pre-show selector and hype man to get the party in the mood, Konshens made his entrance – backed by France’s Dub Akom band and embellished by a skilled dancer. As well as his own hits, he hailed the artist due to come next, Tarrus, with their combination Good Girl Gone Bad. Fusing the two extremes of such a creative culture, Tarrus Riley’s set offered something for everyone. His bell of a voice sounding like his records, the son of the late great Jimmy Riley barely paused between songs such as Beware, Superman, and She’s Royal, delivering his fans both quantity and quality. He shared a new song on the rhythm to Black Uhuru’s Guess Who’s Coming to Dinner, and brought back Konshens to the stage for another combo, Simple Blessings and a second, double-teamed Good Girl Gone Bad. 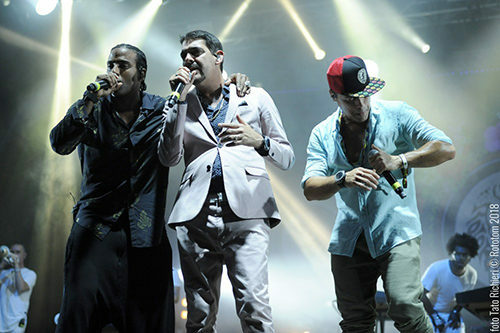 After the diversity of Jamaica, the music shifted to the neighbouring and equally musically important island of Cuba for the finishing set by Orishas. There was a sense of symmetry: just as non-reggae artist Ben Harper had given the closing show on the first night of the festival, the hip hop/son/Afro-Latin fusionists ended the last. The re-formed group – touring again after a hiatus – seduced the crowd with their lively tempos, syncopated rhythms and Spanish lyrics. They even found the time to crank up the guitars for a riff on Deep Purple and Lenny Kravitz and blow a brass dubstep burst of Seven Nation Army. A week of constant music passed into history – leaving countless memories behind.